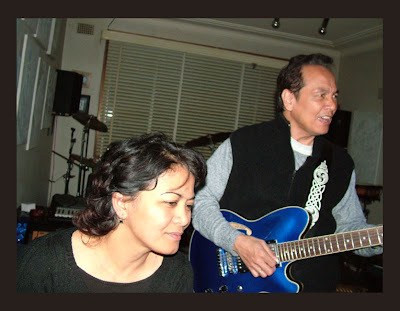 It's been exactly a year now since Jim Paredes arrived and permanently settled in Australia. However in this jet age where people have wings, terra Australis can't always have its back massaged by Jim. 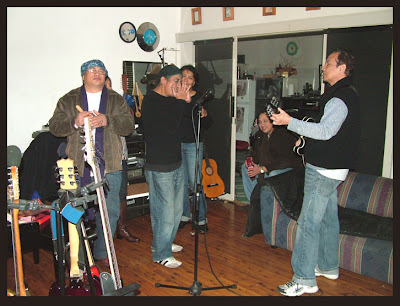 He just got back to Sydney after a successful Apo Hiking Society tour in the United States and Canada. I guess the group's popularity would never wane as long as these veterans of Original Pinoy Music can get together anywhere in the globe. 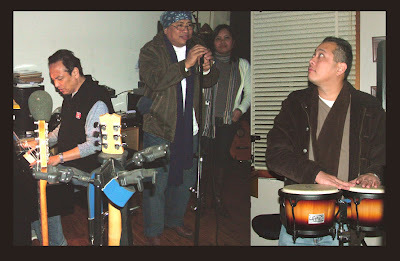 Their musical legacy would always be part of the Pinoy genetic strands. I doubt if there's a Filipino household in Australia that doesn't have a tape or cd of APO. Jim seems to be settling well and is currently busy with his photography. Can't wait; he promised to show me his portfolio. 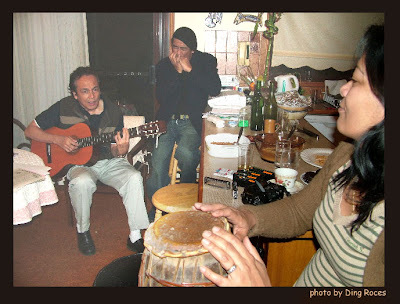 Just recently he joined us and some musically-minded friends to liven up a "surprise" little tea party for my partner Menchay who celebrated her birthday last Sunday. 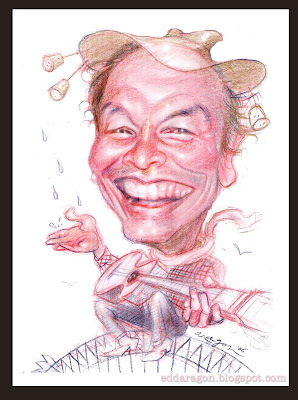 Here are photos I intermingled with my feature interview article (below) and caricature drawing (above) of Jim last July. Jim Paredes of the Apo Hiking Society, incontestable somehow, emanates positive vibes, an apostle of good via his artistic talents. 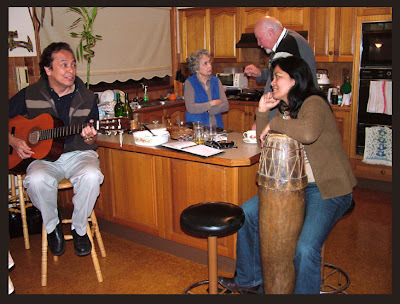 Jim now lives in Australia with his family, and is a most welcome member of our Filipino-Australian community. 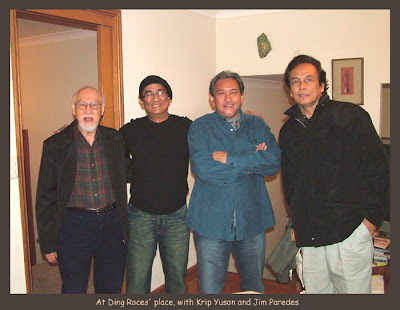 I first met Jim when visiting filipino writer Krip Yuson was in Sydney. Both are good friends. only by gulps of his lovely shiraz…and this interview. EA: Hi Jim. Why Australia? JP: APO’s great. 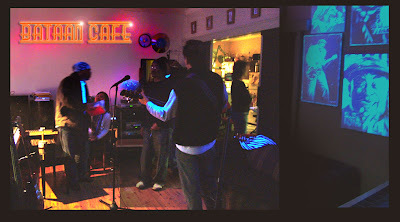 We are doing a concert in Melbourne on August 4 and in Sydney on August 5. I am quite excited to see my friends after 3 months of living here. After a while, I will be joining them again in the Philippines, Guam and Saipan for a few concerts. Then I join them again for a short October USA tour. For the past three years we have been touring a lot so my moving here does not really disrupt APO. EA: Shall we hear terra Australis-inspired songs in your compositions with APO in the future? JP: Hmmm… I’m absorbing a lot of things here. I will not be surprised if they influence my musical output in the future. I have not been exposed to a lot of the music from here but the experience of living here and all the emotional aspects of this definitely gives me a lot of material to write about. EA: Well looks like you’re settling in quite well in Australia. 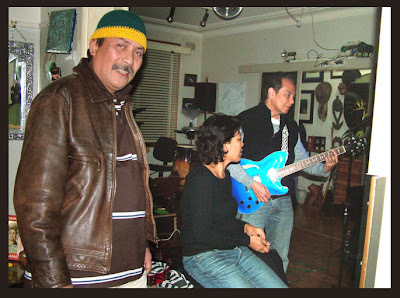 Marami ka pa bang culture shock blues? JP: Ha ha! Not that much although meron pa rin. Getting a driver’s license was one of them. While it was a chilling experience, I respect it and I think it speaks well about Aussie life that they do not compromise on qualifications for licenses. But in many ways, my culture shock comes from what I feel as an ‘overregulation’ of everything. Maybe it’s the Pinoy in me that is coming to that conclusion. Or maybe I just need to stay here a bit longer to fully appreciate it. EA: You seem to lift people’s spirits up; not only in person but in your blogs (blog links below). Do you find romance in the esoteric? JP :Yes. I definitely do. And not just in the esoteric. I think I am one person who will find it hard to NOT be fascinated by the ordinary things in life. It is my nature and my spiritual practice as well to be appreciative of however life wants to show up. EA: You’re into photography. Saw portrait photographs of your daughter Ala in your website. They’re awesome. Has photography always been an interest? Did the digital age somehow make it easily accessible? JP: I’ve been a professional photographer for 10 years now. I love photography. The digital age has made photography more accessible and at the same time it has changed the game. I used to shoot on film. I still brought my medium format equipment with me from home. But since switching to digital, my instincts have been altered somewhat. M favourite themes are women and portraiture although my last exhibit in Manila was all about air, water and earth. I am definitely getting into photography here and am open to jobs—portraiture, weddings, events. My small studio is actually ready for clients. EA: Bro, kwento naman ng pamilya, plans,etc. JP: I brought my whole family here. We’ve always wanted to experience living abroad and I thought this was the best time to do it. 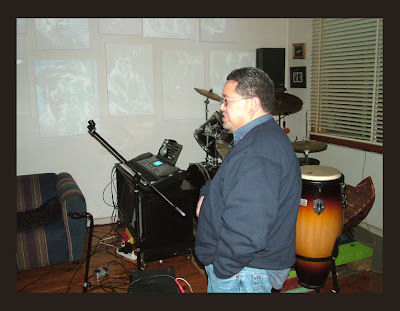 I want to give my children a chance to experience another milieu, culture and system. I told them that if they like it here, they can stay. If they don’t they can go home after awhile. At least I am giving them a chance. JP: The community here is a relatively small one. 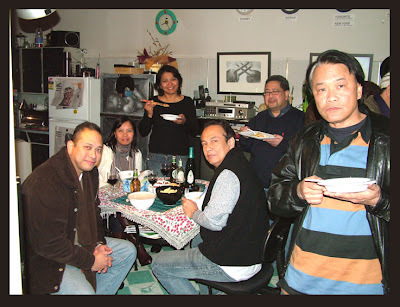 I have met Pinoy communities all over the world. The US has some really big and developed Filipino communities. It’s not surprising since the communities there are much older. The community here, from what I see is getting to be more cohesive and that is a good thing. But I wish that ALL communities abroad were more united. I don’t really see the point of having too many associations and organizations. Like everywhere else, Filipinos here like to belong to smaller subsets than one big set. May provincial associations, may professional associations, etc.. I am not sure if it is good or bad. Maybe it’s just the way we are right now. At least kahit papano, there are tangent points that unite us somehow. 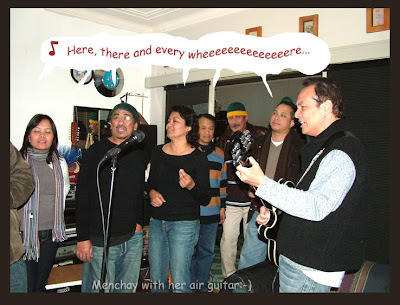 I'm really an Apo Hiking Society fan and often sing and strum their songs, specially "Pumapatak na naman ang Ulan"; just right for Sydney's wet and bitter cold. 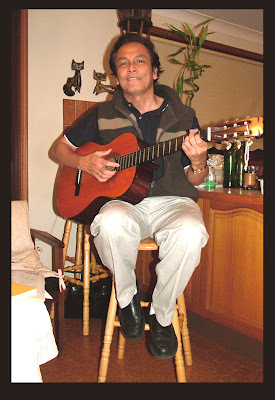 Jim has also composed a song about EDSA which was sung and heard nationwide in its first anniversary by Apo. (lyrics in this article). Jim, a nationalist; an objective and progressive thinker you are based on your song lyrics. Is this true? JP: I wrote Handog Ng Pilipino Sa Mundo two weeks after the EDSA 86 Revolution. 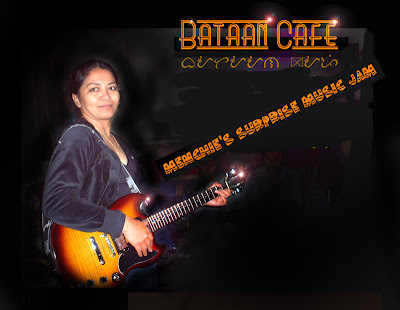 I felt that the Spirit of Edsa took over me and wanted the song written. I wrote it in two minutes even if it takes 5 minutes to play the song completely. Let's just say that sometimes, inspiration and art can defy time and must make itself manifest in a 'timeless' way. 'Di na 'ko papayag mawala ka muli. 'Di na papayagang mabawi muli. Kelan man 'di na paalipin. Tinig ng bawat tao'y bigyan ng pansin. EA: Thank you Jim. It’s an honour meeting an artist like you that inspired (with Boboy and Danny) a whole generation of Filipinos. JP: You are welcome, Edd.